Plaque is the primary etiological factor in gingival inflammation. Oral hygiene failure results information of pathogenic plaque. Therefore, plaque control represents the cornerstone of good oral hygiene practice. The mechanical supragingival plaque control includes the toothbrush, floss, woodsticks, and interdental brushes. However, the degree of motivation and skill required for the effective use of these oral hygiene products may be beyond the ability of the majority of patients. Hence, a chemical plaque control approach is desirable to deal with the potential deficiencies of daily self-performed oral hygiene. Thus, the aim of the study was to evaluate the efficacy of a commercially available herbal mouthwash as an anti-plaque and antigingivitis agent. The present study was a double-blind, parallel, randomized clinical trial. The clinical trial was conducted in the Department of Public Health Dentistry, Sardar Patel Post Graduate Institute of Dental and Medical Sciences, Lucknow. Ethical clearance was obtained from the Institutional Ethical Committee, and informed consent was taken from all the study participants. A study protocol and a case sheet containing general information, the format for recording plaque and gingival indices and subjective and objective symptoms was prepared. Detail flow chart of the protocol is given in [Figure 1]. Subjects aged 18-25 years, having a minimum of 20 teeth, Turesky modification of Quigley Hein Plaque Index of 2 or more and Lobene et al. modified Gingival Index between 1.1 and 3.0 were included in the study. Criteria for exclusion were history of systemic diseases, antibiotic and periodontal therapy in past 3 months , allergy to test products such as irritation and burning sensation, desquamation of oral mucosa, subjects suffering from destructive periodontal disease, using any other chemotherapeutic anti-plaque/antigingivitis products and having severe malalignment of teeth, orthodontic appliances, fully crowned teeth, and removable partial dentures. The study was carried out by a single investigator who was trained and calibrated. Kappa coefficient value for intra-examiner reproducibility was 0.86. In order to bring the plaque and gingival scores to baseline, thorough oral prophylaxis was performed on all the subjects 15 days before the start of the study. This enabled the examiner to ensure that any presence of mild gingival and the periodontal problem would subside during this 2 week period. Group C: Distilled water (control group or placebo). Each subject was identified by a code. All the mouthwashes were dispensed in identical looking plastic bottles measuring 150 ml which were coded as A, B, and C. The mouthwashes were distributed among the subjects during each successive visit. Group allocation and dispensing of the mouthwashes was independently performed by a separate investigator. In the study, both the investigator and the subjects were blinded. All the subjects were instructed to rinse twice daily with 10 ml of the allocated mouthwash (undiluted) for 1 min, after 30 min of brushing their teeth. Subsequent rinsing with water was not allowed. They were provided with measuring cups with 10 ml marking in order to use the correct volume of mouthwash. They were also asked to brush their teeth with a soft nylon toothbrush and a nontherapeutic, low abrasive dentifrice. The mouthrinsing was performed at home without supervision. To check for compliance, the subjects were asked to note the times of day when they used mouthwash. The quantity of mouthwash given to the subjects was precalculated at every visit. At each recall, they were asked to bring the bottles to assess the volume of mouthwash. This gave a view whether the subjects rinsed correctly with prescribed mouthrinse or not. During first recall at 14 th day, both the indices along with subjective (such as taste acceptability, burning sensation, dryness, or soreness of mouth) and objective (such as staining of teeth, staining of tongue, ulcer formation, and allergy) symptoms were recorded. The subjects were instructed to follow the routine plaque control measures and were recalled after 1-week. At 21 st day, the subjects were again assessed for plaque and gingivitis and any reported side effects. SPSS version 16 (IBM Corporation) was used for statistical analysis. Intergroup comparison of plaque and gingivitis scores were done using ANOVA test. The level of significance was kept as P < 0.05. In the groups A and B, there was statistically highly significant reduction in mean plaque scores between baseline and 14 days (Group A; 1.35 vs. 0.98 and Group B; 1.52 vs. 1.17); between baseline and 21 days (Group A; 1.35 vs. 0.75 and Group B; 1.52 vs. 0.89) [Table 1]. In the groups A and B, there was statistically highly significant reduction in mean gingival scores between baseline and 14 days (Group A; 2.06 vs. 1.70 and Group B; 2.05 vs. 1.43); between baseline and 21 days (Group A: 2.06 vs. 0.75 and Group B: 2.05 vs. 1.42) [Table 2]. Regarding taste acceptability, all the thirty subjects (100%) in Group B reported the taste of herbal mouthwash as acceptable. Regarding reported burning sensation of the mouth, Group B subjects (100%) did not experience any such symptom till the 21 st day. However, in Group A, 20 subjects (67%) on the 14 th day and 24 subjects (80%) on the 21 st day reported burning sensation. Regarding the symptom of dryness or soreness, none of the subjects in Group B reported such symptom. 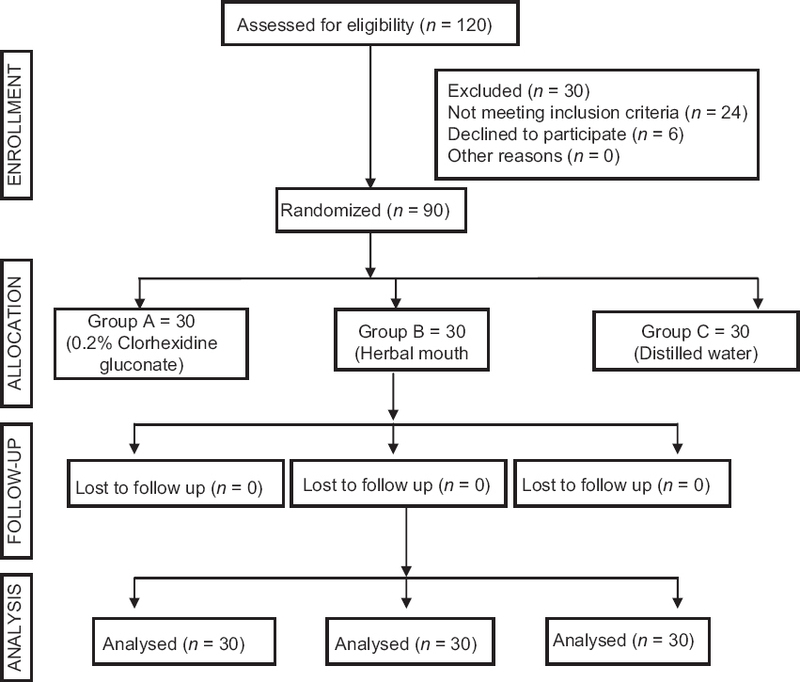 In Group A, two subjects (7%) reported feeling the dryness of mouth [Table 3]. As far as objective symptoms were considered, none of the subjects in three groups had any staining of teeth or tongue, ulcer formation or allergic reaction following the use of their mouthrinses. The 21-day experimental gingivitis model given by Loe et al. was used as the clinical method to test the efficacy of oral mouthrinses. This model had been previously used in many studies and has consistently shown its reliability, validity, responsiveness, and interpretability. Originally, this model was adopted to investigate the influence of a compound on the development of plaque and gingivitis in the absence of mechanical oral hygiene. The present study, however, differed from the original study model in that the subjects instead of total abstinence from oral hygiene; the mouthwash was used as an adjunct to tooth brushing. Such a study design assesses the actual effectiveness of the mouthwash in a real life situation. The study is not without its limitations. A crossover design with wash off period could have been more reliable study design as it eliminates the bias of variable host response. Furthermore, a longer period study could throw light on the long-term advantages and disadvantages of the herbal mouthwash. Further research to establish the level of substantivity, plaque inhibition, safety, and microbial parameters is necessary before this product finds a place among the other agents for daily plaque removal. The findings of the current study can be applied to other clinical settings and public health programs. Both 0.2% chlorhexidine gluconate and HiOra R mouthwashes can be effectively used as an adjunct to mechanical plaque control in the prevention of plaque and gingivitis. However, owing to the side effects reported due to the use of chlorhexidine mouthrinse and biocompatibility and well acceptance of HiOra R mouthwash by the subjects, it can be effectively used as an alternative to chlorhexidine mouthrinse. Sikka G, Dodwad V, Chandrashekar KT. Comparative anti-plaque and anti-gingivitis efficacy of two commercially available mouthwashes - 4 weeks clinical study. J Oral Health Community Dent 2011;5:110-2. Shetty PR, Shetty SB, Kamat SS, Aldarti AS, Shetty SN. Comparison of the antigingivitis and antiplaque efficacy of the herboral (herbal extract) mouthwash with chlorhexidine and listerine mouthwashes: A clinical study. Pak Oral Dent J 2013;33:76-81. Narayan A, Mendon C. Comparing the effect of different mouthrinses on de novo plaque formation. J Contemp Dent Pract 2012;13:460-3. Saraswathi MN, Karthikeyan M, Kannan M, Rajasekar S. Terminalia belerica. Roxb - A phytopharmacological review. Int J Res Pharm Biomed Sci 2012;3:96-9. Vaish S, Ahuja S, Dodwad V, Parkash H. Comparative evaluation of 0.2% chlorhexidine versus herbal oral rinse on plaque induced gingivitis. J Indian Assoc Public Health Dent 2012;2012:55-62. Bhat N, Mitra R, Reddy JJ, Oza S, Vinayak K. Evaluation of efficacy of chlorhexidine and a herbal mouthwash on dental plaque: An in vitro comparative study. Int J Pharma Bio Sci 2013;4:625-32. Liu WR, Qiao WL, Liu ZZ, Wang XH, Jiang R, Li SY, et al. Gaultheria: Phytochemical and pharmacological characteristics. Molecules 2013;18:12071-108. Sharma R. Cardamom comfort. Dent Res J (Isfahan) 2012;9:237. Wadhwa S, Bairagi M, Bhatt G, Panday M, Porwal A. Antimicrobial activity of essential oils of Trachyspermum ammi. Int J Pharm Biol Arch 2010;1:131-3. Rahmani ME, Radvar M. The antiplaque effects of Salvadora persica and Padina essential oil solution in comparison to chlorhexidine in human gingival disease; a randomized placebo controlled clinical trial. Int J Pharmacol 2005;1:311-5. Mohammed SG. Comparative study of in vitro antibacterial activity of miswak extracts and different toothpastes. Am J Agric Biol Sci 2013;8:82-8. Khalessi AM, Pack AR, Thomson WM, Tompkins GR. An in vivo study of the plaque control efficacy of Persica TM : A commercially available herbal mouthwash containing extracts of Salvadora persica. Int Dent J 2004;54:279-83. Lorenz K, Bruhn G, Netuschil L, Heumann C, Hoffmann T. How to select study designs and parameters to investigate the effect of mouthrinses? Part I: Rationale and background. J Physiol Pharmacol 2009;60 Suppl 8:77-83. Vahabi S, Najafi E, Alizadeh S. In vitro antimicrobial effects of some herbal essences against oral pathogens. J Med Plants Res 2011;5:4870-8. Mathur S, Mathur T, Srivastava R, Khatri R. Chlorhexidine: The gold standard in chemical plaque control. Natl J Physiol Pharm Pharmacol 2011;1:45-50.